St. Patty’s Gold Arcade Slot – With a new Bonus Game! The luck of the Irish has come to Bingo Mania with the exclusive, high paying St. Patty’s Gold arcade slot game. This game is now is better than before with the addition of a FREE Bonus Round! How do you win the bonus round you say? It’s easy! When you fill up the glass with gold coins you’ll win the Jackpot AND the FREE Bonus Round. 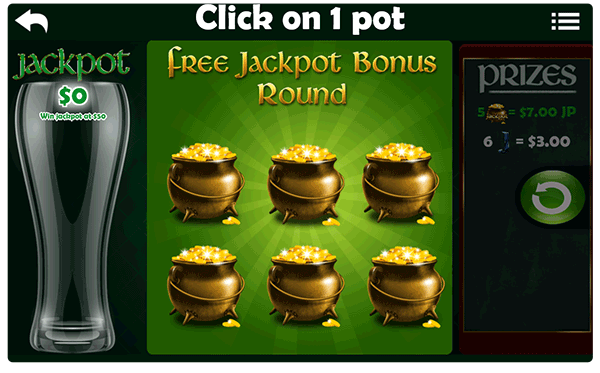 During the bonus round you can choose from six gold pots which will award you with a jackpot bonus! This free jackpot contribution allows you to win the new jackpot faster. By reading this blog you’re the first to know that you have a FREE Bonus round waiting for you as soon as you log in to the website and load this game. Try you luck now and claim your free jackpot if you haven’t yet. Tell us what you think of this new game below & win 1 of 7 Free $5 cash credits to try this new exciting game.